This weekend, we decided to carve our pumpkins we bought last weekend. Usually, I don't carve my own. At least I haven't in a number of years since we were always helping Austen or Peyton and one more pumpkin to carve was just becoming more work. But, I was inspired this year. Guess why? 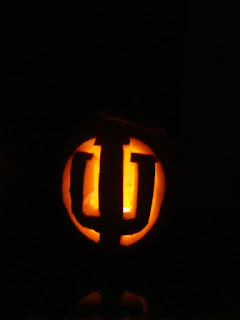 Yup, to show my Indiana pride, I decided this year was the year that I would get back into the pumpkin carving. Not bad for someone who doesn't like to do the actual carving and cleaning of the guts of the pumpkin. I found Tom a stencil for one for Austen too. Of course, he didn't need a stencil. He could just eyeball it and carve it. Peyton didn't want to carve a pumpkin so we left her pumpkin intact. But, here is Austen sitting next to both of them. Stay tuned for what the kids wore for Halloween on Wednesday! It seems like Halloween snuck up on us this year. Usually, we visit a pumpkin patch much earlier in the season. But here it was Oct. 21 and this was one of the last two weekends before Halloween when we could get a pumpkin. So we ventured to a new place this year instead of the tried and true Goebbarts. Aside from the fact that they let you bring your dog, this place was not high on my list of good pumpkin farms. It was small and overcrowded due to its size. Yet, I think the kids (and Adler) still had fun. 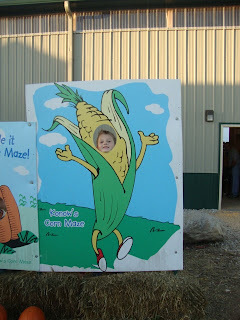 We went through a big corn maze. Went for a pony ride. Despite Peyton insisting we wait in line for forever, she was scared to ride the pony. And picked out our pumpkins. I even bought one this year after a several year hiatus of buying myself one. But I saw a cool idea for carving it that inspired me so stay tuned! I remember in first grade when I clearly knew that I was not in the highest reading group. One day as my group's lesson was over and the highest group came to the table, I started easily reading their book. I remember asking my teacher why I wasn't in that group. To her credit, I remember she didn't tell me that I couldn't, but instead she said let's see how it goes. It must've went okay because I stayed in that group for the rest of the year and became an avid reader. Still am as time permits. In fact, a bookstore is one of the places I feel most at home. I could spend hours in it. When I became a mom, I was so excited to read these great books to Austen, but he was never all that interested. He liked books but I wouldn't say he loved them. Often times he didn't want to sit still long enough to read them instead choosing to play a game. Peyton on the other hand wants to read a book every night and sometimes two or three a night. She loves books and always sits quietly turning the pages reading them. I often find her in her brother's room perusing his selections in his bookcase. So this past week, we decided that Austen, now a kindergartener, needs to practice his reading instead of playing a game at least once a week before bed. He reluctantly agreed and did pretty well. In fact, I think both Tom and I were shocked that he's basically reading. We knew he had been working on sounding out words but in a short time it seems like he went from that to reading. Yes, it's really basic stuff but we were so impressed and proud of him. I think he was pleased and proud of himself too. The next day he insisted on bringing one of his "reading" books to school. Which again surprised and impressed me...usually he's smuggling one of his Lego guys into his backpack. That day he asked me if he could bring a book. For those of you who don't know what a hat trick is, it's when a player scores three goals. Austen had his first hat trick today during his soccer game. I wasn't there to see it in person (I'm in San Diego for work) and yes, he's only five but still a big accomplishment. 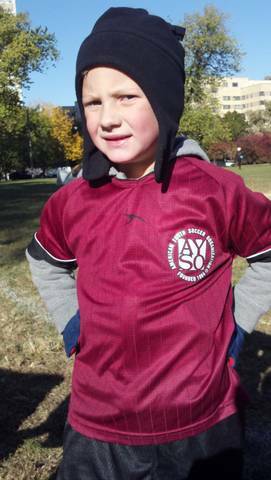 His team scored four goals and Austen scored three of them. This is his fourth week of play and I think he's scored six goals total already. Now I come from a big soccer family. I played the game since I was about 4, so I can say that Austen seems to have a good understanding of the game for a five year old. He's a natural defender but will break away to score goals and he's got some speed too. I love watching him play. And, I think it would be hard if he wasn't good at the game that I love or even worse, if he didn't want to play at all. Lucky for me, he does right now, and I'm loving every minute of it.